Positive Political Change in Chicago? Is the city of many nicknames ready for political change for the better, serving its residents more equitably? Familiar nicknames include the Windy City, referring to political, not atmospheric, wind; Second City (to NY), Sinatra’s My Kind of Town, That Toddlin Town, for poet Carl Sandburg the City of Big Shoulders, among many others. William “Big Bill” Thompson was Chicago’s last Republican mayor, his second of two terms ending in November 1931 – undemocratic Dems running the city since then with one exception. He served until November 25, 1987, the city’s 41st mayor, a cut way above his predecessors and successors, dying prematurely in office at age-65, a tragic loss. He was found slumped over his desk in city hall unconscious, rushed to nearby Northwestern Memorial Hospital where attempts to revive him failed – leaving supporters shocked, dismayed, and deeply saddened over the loss of the only mayor in memory who addressed the rights and well-being of ordinary city residents. Heart failure took him, a larger than life figure in stature and physical size with an unhealthy enlarged heart, what the diagnosis of his death confirmed. No one like him followed as city mayor. He was an exception to the rule. Long ago alderman Paddy Bowler saying “Chicago ain’t ready for reform” didn’t apply to Harold, what many Chicagoans called him affectionately. Winners of Chicago Dem mayoral primary elections automatically go on to defeat GOP rivals in the general election, how it’s been for almost 90 years, this time no different with a twist. Of the 14 Dem aspirants competing in the February 26 primary, six were African-Americans, two winning more voter support than others. They’ll meet in the general election for the mayoral post on April 2. For the second time in Chicago history, a Black candidate will become mayor, the second woman ever to hold the post. Jane Byrne served as city mayor from April 1979 – April 1983. A personal note: After leaving office and losing its perks, amenities, chauffeured limousines and all the rest, Byrne stood in front of me in the same line at our local bank, waiting like others to reach a teller to conduct our business – what city mayors have subordinates do for them along with other personal chores, no longer when returning to private life. On April 2, either Toni Preckwinkle or Lori Lightfoot will become Chicago mayor, whether a crack in longtime machine politics is achieved remains to be seen. Several progressive challengers entered the race to succeed establishment Mayor Rahm Emanuel, former congressman, Obama chief of staff and investment banker – known as Mayor 1%, serving the city’s privileged class, disdainful of its ordinary mass majority. Preckwinkle and Lightfoot finishing ahead of other mayoral aspirants bore testimony to Chicagoans wanting political change – getting it another matter entirely, but hope springs eternal even in a city known for corrupt machine politics fed by deep-seated political patronage. Machine favorite Bill Daley losing was a positive sign, brother of former Mayor Richard M. Daley, son of Richard J. Daley. The family ran Chicago for 43 years, supported by a rubber-stamp City Council, much the same under hardline neoliberal corporatist Emanuel. His father, Benjamin, was involved in smuggling weapons to the Jewish Irgun underground terrorist group (co-led by future Israeli prime minister Menachem Begin) in Palestine pre-1948. Emanuel served as an IDF volunteer during the 1991 Gulf War, holding dual US/Israeli citizenship, notoriously pro-war throughout his political career. He won’t be missed. Hopefully Chicago’s next major will be more social-minded, cut out of the Harold Washington mold, supporters calling his time in office the city’s camelot period lost with his untimely death, his legacy dismantled by successors. He was a people’s mayor, a community leader with ties to grassroots organizations, combined with political savvy, independent of city machine politics – all of the above reasons for his popularity, able to forge progressive multi-racial/multi-ethnic coalitions, successfully dealing with opposition machine pols. His time in office was Chicago’s finest hour. Can it be resurrected by Preckwinkle or Lightfoot? Supporters believe they represent progressive social change. 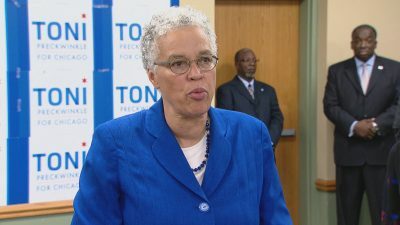 Preckwinkle is president of the Cook Count Board of Commissioners, a former Chicago City Council member, an advocate of affordable housing, a living wage, and other social issues, a strong opponent of notorious city police brutality and use of excessive force against least advantaged residents. Lightfoot was a federal prosecutor, earlier involved in investigating Chicago corruption. She formerly served as chief administrator of the city’s Department of Professional Standards, a defunct police oversight group. Most recently, she serving as a senior equity partner in the Litigation and Conflict Resolution Group at Mayer Brown LLP, providing services for the firm’s clients. Her responsibilities included involvement on its Diversity and Inclusion Committee. Weeks ahead of Chicago’s April general election, ordinary city residents hope their new mayor will serve all Chicagoans equitably – a positive sea change in pre-and-post Harold Washington’s tenure if things turn out this way.